While Fox's Scream Queens will satiate teen fans looking for a genre fix on TV this fall, its Starz upcoming Ash Vs. Evil Dead series that true gore hounds are hungry for, making it one of the most anticipated horror projects on the horizon. Last year, Starz confirmed that Bruce Campbell will return as the iconic Ash for 10 half-hour episodes, essentially giving long-time Evil Dead fanatics a five hour sequel to the franchise. 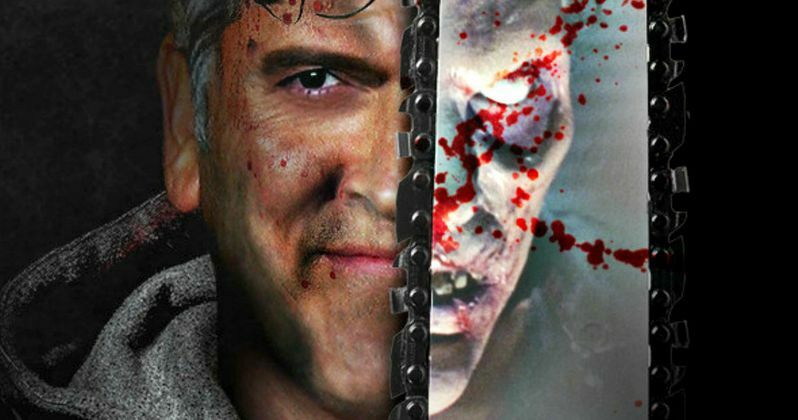 In a new interview with Dread Central, Bruce Campbell reveals that co-creator, co-writer and producer Sam Raimi, who will return to direct the pilot after directing the first three original movies, has a 5 season plan in place. He also offers more details about the plot and the new characters who will fight alongside Ash. "I was there during the casting process, and they're very talented. Aside from the ensemble [aspect], they each needed to be able to hold their own because they'll have their own series of missions. It's an epic tale. How could you not [plan for that]? I'm a strong proponent of the 'big picture' plan, and we are planning for five seasons." "We are competitive with The Walking Dead like, 'We'll show those fuckers!' [Our] Deadites are very clever. They not stupid shufflers. They can mimic people; they can drive cars. They're a fun threat. They ['The Walking Dead'] are right up there [though] with being responsible for the current resurgence [of horror]. We have a wonderful room of talented writers. I'm bringing everything to the table. It's a feisty version of Ash, who's grizzled and just wants to be left alone." "It's the last laugh. We've come full circle. The first Evil Dead film allowed for the most artistic freedom on anything I've worked on. Starz is giving us the same opportunity with this series." What do you think? Are you ready for five years of Ash Vs. Evil Dead? Should we just see how it goes at first? Or is this just too much to handle all at once? One question that wasn't answered: Will Jane Levy return as Mia to help Ash fight his long fight? If the show is set to air over the course of the next five years, leading us into 2020, its safe to say that anything is possible.